The Latin American/Asian food retail story that started in the mid 1990s, which featured waves of foreign direct investment by global multinationals such as Ahold, Walmart, and Carrefour, has recently begun in Africa and there are pockets of supermarkets growing in southern and eastern Africa [1,2]. According to a study by Reardon et al. , post-apartheid South Africa has become the African front-runner with roughly a 55 percent share of supermarkets in overall food retail. South African retailing is composed of two different sectors: the informal sector comprising hawkers, small stands and spaza shops, and the formal sector consisting of large format hyper- and supermarkets, smaller superettes and then “non-major” stores like convenience stores, urban counter and self-serve stores . The progression of the formal sector stores is similar to the experience of retailers in Argentina and Costa Rica where the format changed from supermarkets to hypermarkets and then convenience stores. Geographically, retailers moved from high-income areas and in major cities to rural towns and townships where they began to cater to middle and lower income strata . South Africa’s growth over the past decade has largely benefited the upper income group with 40 percent of the country’s income going to 10 percent of the population . Agriculture does not make as significant a contribution to South Africa’s GDP as it does in other African countries, amounting to 2.3 percent in 2010 (from StatsSA). From the early 2000s, the stronger Rand resulted in lower profitability from exports and the agriculture sector actually shed workers . Thus, the agricultural trends from the apartheid era continue: a divided agricultural economy with large-scale commercial producers on one side supplying supermarkets and processors and poor small-scale producing for subsistence . 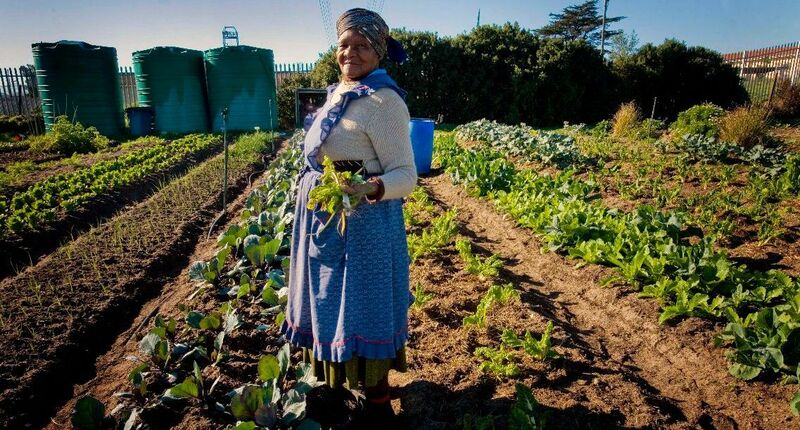 With very high levels of poverty, especially in rural areas, the South African government’s New Growth Path strategy highlights the need for rural development with a specific focus on smallholder job creation . These wider trends are affecting agricultural choices at the local level and need to be harnessed to improve the adaptive capacity of rural households to the uncertain future impacts of stressors like climate change. As will be shown below, the private sector, and retailers in particular, are increasingly becoming engaged in this process. South Africa’s two top retailers, Pick ’n Pay (est. 1967) and Shoprite Checkers (est. 1979), have approximately 40 percent of the turnover in the sector each and have also invested heavily in other African countries as well as India, Australia and the Philippines . As Johannesburg Stock Exchange (JSE) listed companies, they ranked 127th and 129th respectively in the 2009 Stores global survey, making them relatively important players, especially in southern Africa . Woolworths and Spar complete the formal retail sector with Massmart (which has now been taken over by Walmart) and Metcash being the country’s two main wholesalers . With growing urbanization and a burgeoning middle class, food retailers play a significant role in the country and are vital actors in the agri-food chain for innovation around development issues  and potentially climate change adaptation too . That being said, this “rapid rise of supermarkets” has also extended into poor neighborhoods and the new trend in the region is of “supermarkets to the poor”, making them important both from a food security perspective, as well as for rural development (Weatherspoon and Reardon , p. 1). (1) To promote development and job creation in order to establish a viable customer base/ reliable farmers. (2) To ensure that the food system is resilient to processes of global environmental and economic change (i.e., “double exposure”). (3) To build a successful food sector through creating and sourcing products that not only meet the needs of customers and international food safety requirements, but also are socially acceptable for an “African context” . Although I do not expand on the “African critique” to Western-style liberal democratic governance (see Swilling et al. for an in-depth analysis of governance in African cities), many of its criticisms reflect the problems identified in the mono-centric approach to food governance . The importance of “relational capital” in a complex, fluid and inter-connected society with entrenched diversity does not map well onto the governance schema proposed by development institutions . We need to only look to the failures of structural adjustment programmes (SAPs) and in particular their impact on the food system, to get a sense that there must be a wiser alternative for food governance in Africa . In Africa, South African companies dominate as they play a similar role on the continent to that of multinationals globally, but they still face resistance in many African countries because their expansion is viewed as a form of neocolonialism . In response to this dilemma, a key development in corporate governance in South Africa has been the establishment of the King Code on Corporate Governance. These are unique because of the distinct situation of governance in South Africa that was situated in a “highly turbulent and fluid context ...where South African companies [needed to meet] international corporate standards without neglecting their allegiance to the African continent”, echoing former president Thabo Mbeki’s call for “An African Renaissance” (Roussouw et al. , p. 301). Many of the companies, facing the tension between adhering to global standards and models of best practice and the local implementation of these ideas, have established governance mechanisms where the messier network of stakeholders and interests is taken into account . Recognizing and responding to this complexity and enhancing the potential for collaboration between a network of interested parties can lead to more sustainable forms of local governance for companies operating under these circumstances (see Hamann and Kapelus  for examples of this from the mining sector, which has been at the forefront of such governance shifts). (2) changing consumption patterns in Africa. Will African consumers go through the same waves of consumerism as those in the West or will it be possible to create a uniquely African consumer market that meets consumers’ needs whilst being both sustainable and fair for farmers? Supermarkets and other food businesses have a key role to play in deciding the path that African food systems take. 1. Weatherspoon, D.; Reardon, T. Supermarkets in Africa: Implications for Agrifood systems and the rural poor. Dev. Policy Rev. 2003, 2, 1–17. 3. .Reardon, T.; Timmer, C.P. ; Berdegue,´ J.; Barrett, C.B. The rise of supermarkets in Africa, Asia and Latin America. Am. J. Agric. Econ. 2003, 85,1140–1146. 4. EDD. The new growth path: The framework. Technical report; Economic Development Department: Pretoria, South Africa, 2010. 6. Deloitte. Global Powers of Retailing Report; Deloitte: New York, NY, USA, 2009. Available online: http://www.deloitte.com/view/en gx/global/e29655baf1001210VgnVCM100000ba42f00a RCRD.htm (accessed on 12 January 2012). 7. Louw, A.; Vermeulen, H.; Kirsten, J.; Madevu, H. Securing small farmer participation in supermarket supply chains in South Africa. Dev. S. Afr. 2006, 24, 539–551. 8. ereira, L.; Ruysenaar, S. Moving from Traditional Government to New Adaptive governance: The changing face of food security responses in South Africa. Food Secur. 2012, 4, 41–58. 10. Malan, D. Corporate citizens, colonialists, tourists or activists? Ethical challenges facing South African corporations in Africa. J. Corp. Citizensh. 2005, 18, 49–60. 11. Swilling, M.; Simone, A.; Khan, F. “My Soul I Can See”: The Limits of Governing African Cities in a Context of Globalisation and Complexity. In Democratising Local Government. The South African Experiment; University of Cape Town Press: Cape Town, South Africa, 2002; pp. 305–327. 12. Roussouw, G.J. ; van der Watt, A.; Malan, D. Corporate governance in South Africa. J. Bus. Ethics 2002, 37, 289–302.